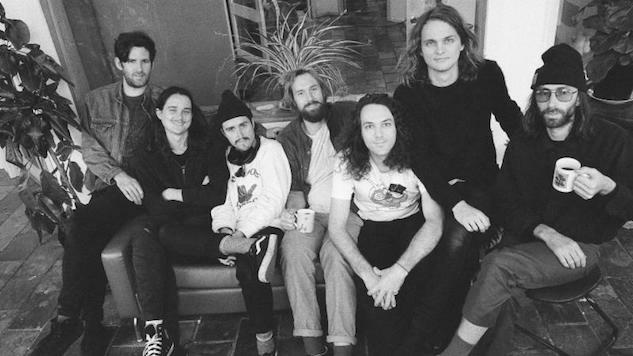 After an epic wave of five studio albums released in 2017, King Gizzard & The Lizard Wizard have announced their upcoming North American spring tour, beginning Jan. 31 at the Hollywood Palladium in Los Angeles. 2017 saw the release of the band’s five albums, Flying Microtonal Banana, Murder of the Universe, Sketches of Brunswick East (which made Paste’s list of 2017’s best albums), Polygondwanaland and Gumboot Soup. The Australian band, formed in 2010, said during a performance for KEXP that their sound was inspired by Turkish folk music. Because of this, the band members restrung their guitars to sound like a Turkish instrument, the baglama. This technique of re-fretting guitars to sound like baglamas has been described by the band as “microtonal tuning” and can be heard all throughout the group’s album Flying Microtonal Banana, a reference to the band members’ shared yellow guitar. The seven-man band will travel to 18 cities before ending their tour in Austin, Texas for a total of 19 shows across the U.S. and Canada. It seems that after their ultra-productive 2017, King Gizzard & The Lizard Wizard are just getting started. See the band’s tour dates below, beneath audio from the band’s 2015 Daytrotter Session, and revisit our June 2017 feature on King Gizzard here.